Voicemail: Michael is excited about having listener feedback! Barry comments on having ordering kiosks in bookstores; Nathan from CT is a big C2C fan, and doesn't want the show to expand beyond SF and Fantasy; Lonnie Ezell loves the new direction of C2C; Leon asks Stackpole some questions about "Cartomancy"; Shaun from Adventures in SciFi Publishing explains how the new C2C excites him, and wants to know of The Secrets podcast will continue or end. 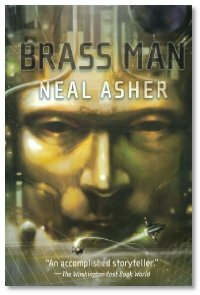 Interview: Neal Asher joins Michael, Summer and Michael to talk about Brass Man, his latest to come out in the US (it's been available in the UK for a few months already). We talk about his wordcounts, which perplex editors and publishers on both sides of the pond, and his incredible proliferation of novels. We also go over the various stories in the Polity that are available from Tor and Night Shade Books, and more. Do you have any questions about writing? Call us and ask! What are your thoughts about "Cover to Cover" expanding book and author coverage beyond SF, fantasy and horror? Comment here, email us, or call in and leave a voicemail. Mr. Asher certainly seems motivated! I must have missed something... could someone in the know explain what the deal is regarding the issue with the term "romance" and Nora Roberts and whatnot? I like the coverage of SciFi/Fantasy, keep it there. Liam - I'm having some sort of issue in posting replies so hopefully this one will go up. Here's the link to the start of the brouhaha. Summer would have to tell you a bit more about the faux-pas and where the romance SMACKDOWN came about. Oh...wow! That's pretty eye-opening stuff. Having never read a romance novel before, I had no idea there were certain rules and expectations and terms considered insulting and the like. That was definitely an experience, and it turned out pretty well in the end. And since there's a lot more fantasy novels that cross into romance and romantic territory, it's nice to know why some stories are readily embraced, and others, not so much. I have a question. How does the 'wanted' length for books by publishers come about? I have seen in the past saying 'prices go up because of the rising cost of paper' - if that was really a big factor wouldn't shorter books be better, economically? Are the 100K words books the books that sell the most, in general for 'original' fiction? (not counting Conan, Star Wars, or whatever). From a consumer's point of view, buying Judas Unchained certainly gets you more words for the dollar - do lots of readers mention this to authors - that they like longer books from a 'bang for your buck' standpoint? I'd have to defer to the published novelists here, but I think because printing costs have gone up (a mmpbd costs about $7.99 USD now), I'd guess that people want to feel that they're getting enough story for their money. I don't know if hardcovers have gone up as much as paperbacks over the past 10-15 years. They probably have, but that's simply my opinion because of what I remember spending on paperbacks. HCs don't tend to fall apart after a dozen readings, where a lot of newer paperbacks seem more fragile after frequent use. I've even gone so far as to buy tpb reprints of older mmpb's I already owned. Hell, I wish all of the omnibus reprints that DAW and others are putting out were coming out in tpb, instead of just some of them... I'd be more inclined to buy them, instead of just thicker mmpb reprints of stuff I already have. As in, I bought tpb reprints of Melanie Rawn's "Dragon Prince" trilogy, and gave the mmpb's to a friend. DAW hasn't reprinted the followup "Dragon Star" trilogy in tpb yet, though. However, DAW reprinted CJ Cherryh's "Faded Sun" trilogy only as a mmpb collection. Silly... I would have bought the tpb reprint without hesitation, but since I already have the individual novels of the trilogy as mmpb, I have no desire to rebuy the collection as an mmpb. That's a question I'd like to pose to someone in publishing... why do they choose a mmpb reprint over a tpb reprint? Orb does classic reprints in tpb, making them more attractive... why doesn't DAW do the same with all their classic reprints? If you could ask one of those expert novelist or other types who know, that would be great. I hate those trade sized things, they annoy me. Waste of shelf space and more annoying to read. I suppose if you read books with two hands normally you wouldn't notice that bit as much, perhaps. You also have to realise those are about $25 in greenbacks, here, too. If all books only come out in this format, I'd just stop buying them, or maybe only get a few electronic. Only time I have ever bought those is remaindered or whatever they call it from bookcloseouts, or got one as a freebie, and been given a couple. Given the list of books I would like to get to (thousands), not much chance of me reading anything a dozen times. 🙂 That would matter more to collectors over readers, I would think, the durability thing. I think I would agree that more recent paperbacks are probably crappier quality in general, than the ones I have from the 70s/80s that are still fine.